How many people would claim that they love killing people? How many of those people do you actually think, if they knew the gruesomeness and cruelty of killing someone, would actually continue to claim that they love killing people? Anders Breivik, the perpetrator of the terrorist attack in Norway, in which he single-handedly walked around an island full of unarmed civilians and shot them one by one, doesn’t even answer yes to the above questions. Breivik has been very straightforward about the brutality of his crime with the utmost details. He has incriminated himself over and over, without remorse. Yet, he did admit one thing: he said that as he was killing people, he had a strong desire to stop the whole time. He said that he only overcame this gut feeling by convincing himself that it was a necessary evil to help society as a whole. So, aside from sadistic psychopaths (I’d argue that although non-sadistic psychopaths wouldn’t feel empathy for people they killed, they would be able to reason enough to decide that its not a good thing to kill random people and therefore have no desire to do so), people have a built in morality against killing random people. We do not need the silly ten commandments to know that killing people is not good. This is instinctive. What were people doing before the ten commandments? Killing each other randomly? Society could not function if this were the case since society is built on trust. Claims are made that modern societies are built on Judeo-Christian values; however, many less violent countries, such as East Asian countries, were not founded on Judeo-Christian values. 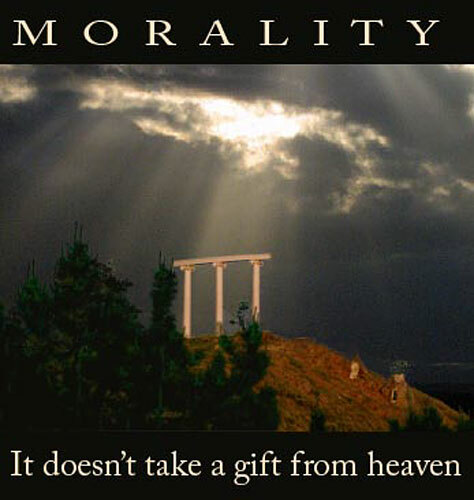 Also, I would argue that it is not even our society that makes us moral. The society just keeps the trust among us for those few who, for whatever reason (bad upbringing, bad DNA or a combination of these two), commit crimes. But, there are always exceptions. Most people will act morally in any political system. People try to use NAZI Germany’s holocaust as an example of how our morality can be molded according to the regime in power. This is absolutely false. If you actually know about the details of how the holocaust was carried out, you’d know that the most difficult aspect of pushing through the holocaust was human reluctance to kill. At first, soldiers were just ordered to shoot Jews. This didn’t last long. Although people naturally will go along with authority, this only goes so far. Watching numerous people die by your own hands is something that few people can endure. Eventually, some German soldiers refused to obey their superiors orders, and this led to a cascade effect of other German soldiers refusing. The result? The gas chambers. If you claim that gas chambers are more cost effective than shooting people, you are not thinking about what is involved in the gas chambers. First, the technology didn’t exist. They had to do some serious R and D to figure out how to pull off mass death via gas chambers. Second, they needed to transport people to gas chambers. Third, they needed to build gas chambers and death camps. Fourth, they needed to man these death camps. Fifth, they had to burn the bodies. Sixth, they had to do this in a way to not alert the local population (who, by their own morals, if they found out, would have become horrified). This is only six reasons, but there are many more. The fact is, the NAZI government learned very quickly that their soldiers were moral and they needed to circumvent this morality very quickly and efficiently to prevent mass mutiny. Even in wartime, there are outbreaks of peace that happen. The Christmas Truce of World War I is probably the most well known example. Even though both sides of the War were taught to hate one another by political and military authorities, suddenly, mass outbreaks of peace occurred between British and German soldiers. It seems it’s actually not that easy to ensure a war continues without pressure from forces above (forces that themselves have not participated in the ugliness of war). It is for these reasons that it really bothers me when someone claims that humans need religion to be moral. This is the greatest insult to the humanity that exists within all of us.